We live in divided times, politically speaking. No doubt the readers of and contributors to Mockingbird have strong and varying opinions about politics, and about presidents past and current. Fortunately, this is not a political post. In spite of our real and sincere differences, surely we can all recognize the light of the Gospel poking around – God moving over the waters, if you will – even in the high places of power. Who knows, we might even catch of a glimpse of grace in action. 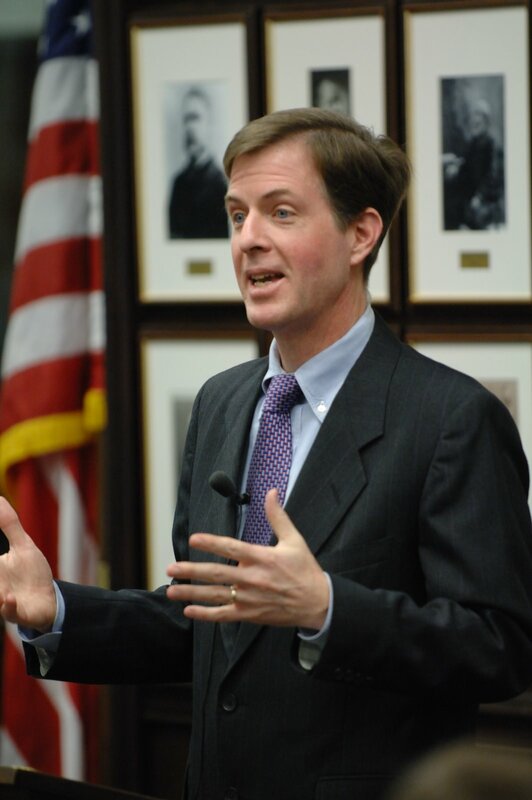 Tim Goeglein was Deputy Director of the Office of Public Liaison under President George W. Bush. He recently gave an interview to Timothy Dalrymple of Patheos, and he told a remarkable story of grace, mercy and forgiveness. It’s a brief tale, but in it we see law and gospel in full force – the overwhelming desire to measure up, and in the process, a man puts his affections out of order and finds himself in need of repentance and forgiveness. He finds both in a most unlikely place. You had your own experience of sin and grace when a reporter discovered that some words in unpaid pieces you wrote for a newspaper had been taken from other sources. You describe this in your book without flinching. What happened? How does someone in the White House, especially someone as savvy as yourself, start down that road? And how did the President respond when this came to his attention? In my time in the White House, I was becoming a very prideful person. This pride and vanity extended to plagiarizing columns for my hometown newspaper. I was not writing about politics, but about many other things that interested me. Pride takes many forms, and one of them is always wanting to be the brightest guy, the one with something interesting to say. I began plagiarizing these columns. I knew what I was doing, and I knew it was wrong. One morning I came to work at the White House and when I opened my email I found a reporter asking whether this was true that I had plagiarized these columns. I literally fell to the side of my desk. I prayed, “Oh God, oh God.” I knew right away that the world as I had known it was over on that day. I felt, as I say in The Man in the Middle, that my world was collapsing. By return email, I told the reporter that it was entirely true, and I was guilty as charged. I had no one to blame but myself. There are, in this world, two kinds of crises. One is where it’s beyond your control, and another is where you’re directly responsible. I was directly responsible, without excuse. I inflicted, as a result of my own sin, shame and embarrassment on the President, and on my colleagues and mentors. I had violated everything I believed in, and was a hypocrite to my wife and children and family. Categorically. So I resigned from the White House that day. That was on a Friday. On a Monday, I came back to the White House to begin clearing out my desk and taking the pictures off the walls. I received a call from Josh Bolton, who had become a friend from the first Bush campaign when we met in Austin, Texas. Josh was now the Chief of Staff, and he said he wanted to see me. I presumed that would be the proverbial “woodshed” moment, which I thoroughly deserved. So surely this, I thought, would be the woodshed moment, and again I completely deserved it. I expected other people to be there, but when I got to the Oval Office the only other person there was the executive assistant. I thought I must have come on the wrong day—but the President called me in. I thought: This is going to be really bad. I went in and closed the door. Goeglein’s desire to measure up led him into a serious error – sin, if you will – that would have ultimately ruined his career and possibly his marriage and family. This was, as Cornelius Plantiga puts it, not the way it’s supposed to be. This is how the law kills us – our obsessions and affections are tainted, and they lead us astray. We find that we ultimately do not measure up to whatever standard we pursue, and in the process we taint ourselves and, like bulls in the proverbial china shop, we often wreck those around us. Goeglin did not just harm himself. His firing would have left his family in a precarious position. He broke trust with his wife and children. He brought shame on them. He brought scandal to the White House. His stood guilty before God and everyone around him. Ultimately, we are not much different. We stand in dire need of forgiveness. Goeglein found that forgiveness in his own boss – the person, on a professional, whom he had betrayed the most. Whatever your politics, here is a picture of the Gospel in action – the offender has “most justly provoked…wrath and indignation” and instead of receiving his just desserts, he finds an open embrace. He is, much like the Prodigal Son, seated in a place of dignity. He is granted pardon and restored. He finds new life and is changed by this overwhelming grace. Thanks be to God for this indescribable gift, because, as Patty Griffin knows, everybody needs a little forgiveness. Don’t you guys know it isn’t fashionable to use George Bush stories in a positive way? Despite this, isn’t this a wonderful story? It is rare to see anything like this even in entry-level or normal jobs, much less at this level of career. Amazing, and a great picture of the gospel. I love that this is about George Bush, it makes it kind of a ‘good samaritan’ type of story. So many people have such prejudice against the guy, maybe rightly so. Lovely. Literally. Has it occurred to us that one compelling reason why the media vilified GWB beyond reason is his adherence to the gospel? Not to judgment, but to the gospel. Few things offend so many, so often.